The April 2017 Greater Atlanta Coin Show enjoyed many visitors on a beautiful spring day. Outside, the sun brightened the daylight hours with temperatures in the upper 70s to low 80s. Inside, the stream of visitors began slowly in the early hours but became a busy flow later in the morning. Thank you to all of our guests for joining us and making the coin show a success. This month, after a visit to the show, Ross Williams of the Marietta Daily Journal wrote an article titled, Collectors from around the Region Come to the Monthly Marietta Coin Show. Our appreciation goes to Mr. Williams and to the Marietta Daily Journal for highlighting the coin show. We also appreciate the people who talked with him and shared their interest in numismatics and collecting. A few dealers missed this month's show and visiting dealers filled their space. Our thanks go to all the dealers with a special "thank you and we're glad you came" to the visiting dealers. Of course, we always appreciate our security. And, finally, we thank the hotel's staff for our space. This month, the hotel hosted two weddings the night before the show and filled the parking lot with vehicles and the convention space with wedding partiers. Sunday morning, our dealers and guests still vied for parking with several big rigs taking space below the convention area. Those trucks hauled trailers filled with items for an event later in the week. No, we're not sure what event, but it had to be big, at least its displays were. Now, let's take a virtual look at some of the numismatics and collectibles on the bourse. Next, let's take a look at an Indian Head Cent from 1867. Professional Coin Grading Service (PCGS) recognized this coin as Mint State 64 Red Brown. David Hall commented on PCGS CoinFacts, "The 1867 Indian cent is rarer than the 1864 and 1865, and about equal in rarity to the 1866 and 1868. It is scarce in all grades and very rare in MS65RD or better condition." "Copper is among the most chemically reactive of all coinage metals. Half cents and large cents of 1793 to 1857 were made of nearly pure copper. Later 'copper' coins are actually bronze (copper combined with other elements, usually zinc and tin). "When a copper coin is first struck, it emerges from the dies with a brilliant red-orange surface, similar to a newly minted modern Lincoln cent. "Once a freshly minted copper coin enters the atmosphere it immediately begins to oxidize. Over a period of years, especially if exposed to actively circulating air or if placed in contact with sulfur-content materials (such as most paper or cardboard), the coin will acquire a glossy brown surface. "In between the brilliant and glossy brown stages if will be part red and part brown. An historical signed letter can increase in value based on the originator, their importance when the letter was sent, the recipient and the letter's content. "Signed documents, such as letters, manuscripts, memos, and other important papers, are one of the fastest growing collecting areas at auction. The personal nature of signed documents connect us to the world’s most important figures, and the stories that they reveal make history come alive in a way that no textbook ever could. If you wish to collect a little history of your own, follow these tried and true tips." Remember, President Roosevelt spent a lot of time at the Little White House and probably knew quite a few of the locals around that area. Plus, 1942 was during World War II. This letter certainly brought some of that history to life. Last on our list for this month is the newly released 2017 silver panda coins. "For 2017, the Chinese Panda design showcases a giant panda sitting in a bamboo forest, stripping leaves from a bamboo stalk he has broken off. Underneath that bamboo stalk is the denomination 10 ¥ (10 yuan ). The weight of 30 grams and purity of .999 silver curve beneath the panda. 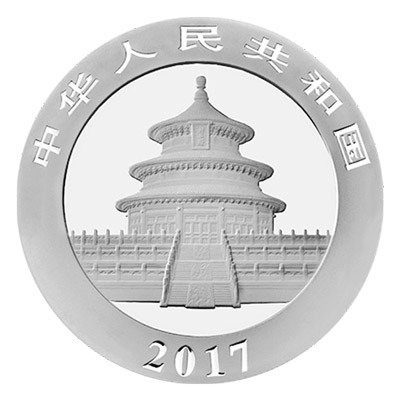 "The obverse of the 2017 30 gram Chinese Panda silver coin remains unchanged. This side is dominated by the image of the Hall of Prayer for Good Harvests, located in ancient Temple of Heaven in Beijing. Above the scene is inscribed "Peoples Republic of China) in Chinese. Below the temple is the year-date 2017." Of course, one can purchase the silver panda coins individually, in a group of 15 or in even larger quantities. 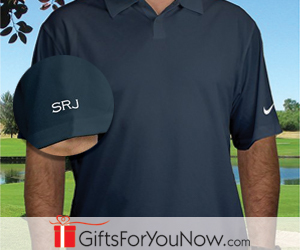 Several dealers offer a quantity discount at 15 and higher. For 2017, China has increased their expected production from eight million silver panda coins to ten million coins. In their second year of metric weights, the coins are 30 grams or 0.9645 troy ounces. 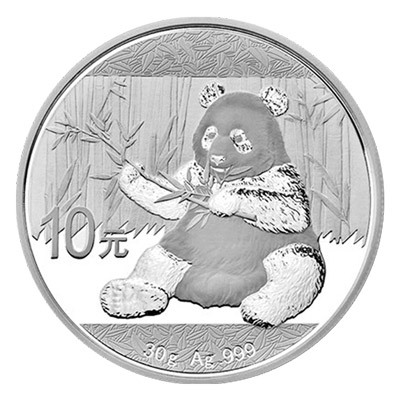 The silver coin with its portrayal of the cute black and white panda bear remains popular with numismatists, metal investors and people who just like pandas. The CoinFacts statistics for this coin in its BN (brown), RB (red and brown) and RD (red) states are also interesting. Initially, the US Mint produced over 9.8 million of the coins. 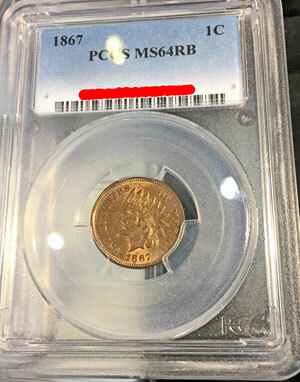 Today, PCGS shows a survival estimate of 5000 of all grades of the BN (brown) 1867 one-cent coins with 160 in MS 60 or better grades and 12 in the MS65 or better grades. For the RB (red and brown) coins, they estimate 750 in all grades remain with all 750 in MS60 or better grades and 70 of those in MS65 or better grades. As Mr. Hall stated, the RD (red) versions are the most rare with 200 in all grades surviving at MS60 or above grades and 30 of those in MS65 or better grades. Even though not a RD, this was a beautiful example of the 1867 Indian Head one-cent coin. Forwarding ahead a few years, the next example is a three-cent coin from 1882. 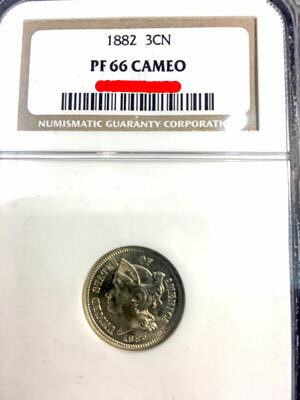 For this example, Numismatic Guaranty Corporation (NGC) graded the coin as PF 66 CAMEO. "Proof sales slid a bit for 1882, but this date is still rather common as compared to pieces from the 1860s-70s. The demand is higher than would normally be the case, as the mintage of coins for circulation was quite low. Most date collectors settle for a proof, due to the rarity of MS examples. "The coin illustrated is typical of many proofs from the 1880s in that it has an incomplete strike and less than fully brilliant fields. Numismatists have struggled for a century and more to distinguish proof-like currency strikes from mediocre proofs, as they so often look very much alike. Until fairly recently the prices for both were about the same, but MS coins are now more highly prized for their rarity." For this year and denomination, the US Mint produced 3100 of the proof coins. Statistically, NGC shows a total of 147 graded 1882 three-cent coins and of those 50 were graded at Proof Cameo 66. First, someone familiar with the show brought a family letter from President Franklin D. Roosevelt, signed and dated in 1942. If you thought numismatics had many components to determining value, letter collecting can be even more challenging. 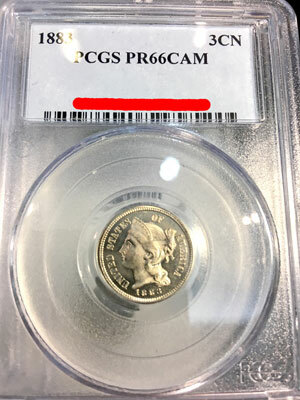 Next on our tour is another proof cameo coin, but this one is an 1883 three-cent coin graded by PCGS as PR66CAM. The US Mint produced 6609 of the proof version of the 1883 three-cent coin. Today, PCGS shows their population of the Proof Cameo at 239 with 88 of those being Proof Cameo 66. Per the ANA Grading Guide, a Proof 66 coin "has above average quality of strike and full mirror (or other style Proof) surface, with no more than two or three minor but noticeable contact marks. A few light hairlines may show under magnification, or there may be one or two light scuff marks showing on frosted surfaces or in the field. The eye appeal is above average and very pleasing for the variety." "On a Proof coin, the contrast between a mirror-like field and the frosted or satiny (cameo) portrait or devices. Sometime abbreviated CAM on holders. Deep cameo, or DCAM, is sometimes seen. Some of this is semantics, with actual differences being slight between various cameo designations. Compare to deep cameo contrast and ultra deep cameo contrast." Both of these cameo coins - the 1882 and the 1883 - are beautiful specimens of coins over 130 years old. Next on our list is a much younger coin; this one only 45 years old but with interesting characteristics. PCGS graded this 1972 Lincoln one-cent coin as MS64RD DDO FS-109. Translation: this coin is Mint State 64 Red Double Die Obverse with FS-109 components. In 1972, the US Mint produced several different Double Die Obverse versions noted as FS-101 through FS-110. And, some believe there are more than ten different double die varieties for the 1972 cent. Variety Vista's web site provides more detail about the ten different versions of the 1972 Lincoln Cent Double Die Obverse. 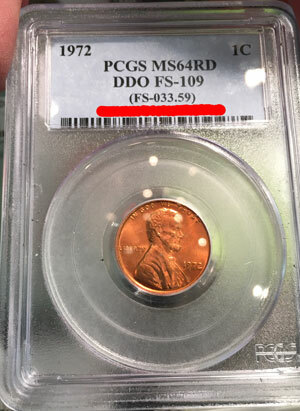 For the FS-109 variety, they accumulated the PCGS and NCG populations and show 78 of the coins graded with the lowest grade at MS50 and the highest at MS66. Per Jaime Hernandez on the PCGS CoinFacts page: "The 1972-P Doubled Die Lincoln Cent Type 1 is considered one of the major varieties in the entire Lincoln cent series. 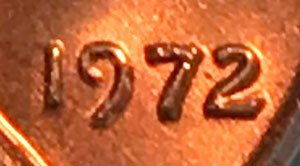 There are over 10 different doubled dies for the 1972 Lincoln cent but only the Type 1 is considered major." As for the FS-109, or the ninth variety, like this coin, the doubling is most prominent on the "2" in the date. The numismatic cost for this type of coin is in the low three-digits, so not very expensive. But when you think of it as a coin that can still be found in pocket change and it started as one-cent, the numismatic value appears to be an attractive premium. In May, the dealers will again fill their showcases with new, old and recently acquired numismatic and collectible items. Come see the coins, currency, bullion metals, monetary collectibles and other interesting objects on the coin show's bourse on Sunday, May 7, 2017.